I’m loving those swans, and the little pink rabbit… oh, and that little lamb! So perfect! And then you must take a look at this new collection of three prints. 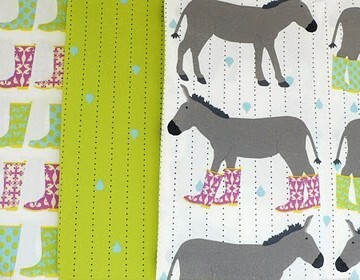 I gasped out loud when I first saw those donkeys in rainboots… Wouldn’t this make a fabulous baby blanket or quilt? 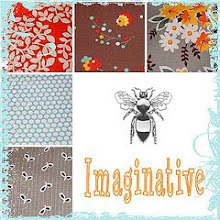 All of these fabrics are currently available through Laurie’s shop! Speaking of Laurie and her wonderful fabrics, I had a few scraps left from her quilt, and since I’ve been trying to use up my scraps, I decided to make up a couple of pillows for a couch which has always been pillow-less. I paired Laurie’s fabrics with some solids, and some other scraps, including a few of the purple and orange prints from Denyse Schmidt’s Hope Valley line. On the first pillow I made up some simple squares, and on the second, I pieced together some of the smaller strips and then cut them into squares. I quilted the front of each pillow with a few simple straight lines, and since I didn’t have any zippers on hand, I went for an envelope closure on the back. To jazz them up a bit, I even added piping! It’s kind of funny how impressed I am with myself when I make piping. I really think it adds the perfect finishing touch, and I’m always pleasantly surprised at how easy it actually is! I followed the section on piping in this tutorial. 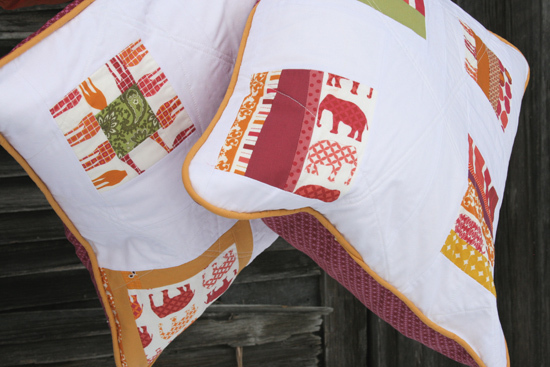 If you’re interested, Laurie still has this colorway of the Urban Circus listed in her shop! 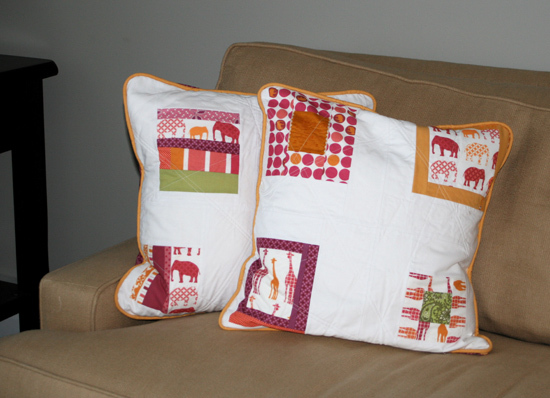 This entry was posted in Fabric, Household Goods and tagged animal sherbet, Fabric, laurie wisbrun, patchwork, Pillows, scarlet fig, urban circus. Bookmark the permalink. 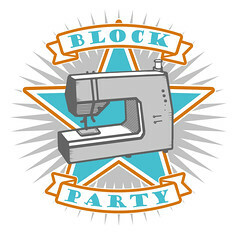 modern quilters in new england? Love the donkeys and the little lambs! I need to scoop up some of these cute prints. Thanks for the link to the piping tutorial. I was not aware of Laurie, her fabrics, her blog, or her shop. But I am now! I LOVE her work! The designs and the colors. And you have made fabulous pillows from her fabric! 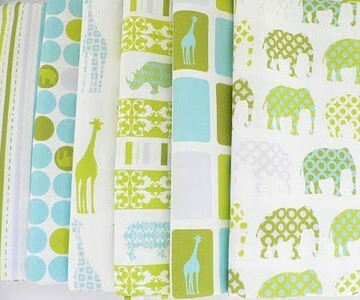 As soon as you posted your Animal Sherbet quilt, I immediately bought some fabric from Laurie. It is a bit more expensive but it is so unique and the colors so fabulous that I highly recommend it. I love the donkeys with the rainboots. Too fun! OH MY! 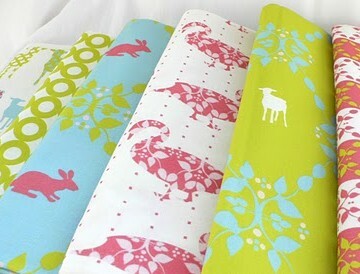 I am LOVING these pillows, SO tempting to go and buy her fabric! Thanks for the inspiration. I too need to get brave and do some piping one of these days! As soon as I saw your quilt made with Laurie’s fabric, I knew I had to have some. It is such nice fabric – like some of my favourite stuff ever. Now we are collaborating on making some fabric to recover my dining room chairs – think her itty bitty chairs with a chocolate background and robin’s egg blue and white chairs – to absolutely die for. Laurie is a total sweetheart and her fabric is delightful. I think that I pretty much will always have some of her gorgeous fabric on hand (when I am not sitting on it eating dinner with my family). Now to order more to make some pillows – thanks for another great inspirational idea, Ashley. Love, love, love the greens and blues. Never heard of Laurie but I’m off to check out her shop. I love that you and others are sharing instead of just hoarding all this good stuff!! Just sent her a convo – those fabrics are SO cute! And thanks for the link to the piping tut…it’s always intimidated me! 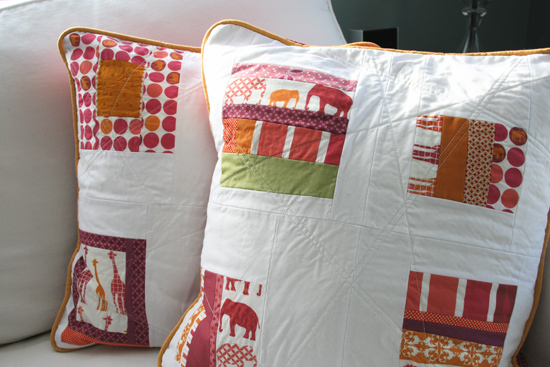 Great fabrics- and pillows! I just added her Etsy shop to my favorites- those donkys and lambs are just too cute! Thank you so much for that link to the piping. Some couch cushions are on my “to do” list. This tutorial just made them move up the list a bit! Ashley. Your work has once again left me a bit breathless. I absolutely love the way you put your patterns together. 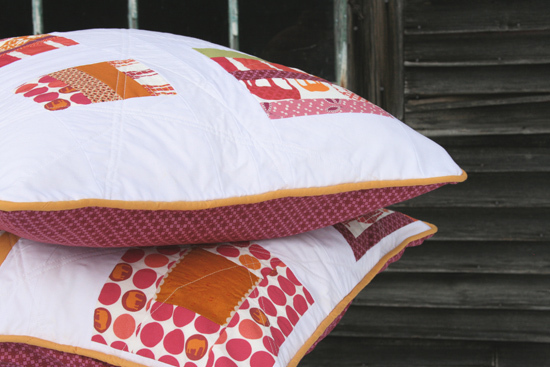 And the diagonal quilting on the pillow is so unexpected and lovely. The pillows are beautiful! I thrilled to be a sponsor! Thanks to everyone for the really nice words and emails about my patterns. And thanks for popping over and visiting my shop! The pillows look great. Thanks for the link for piping. Sweet thing, you’ve done it again. Love the pillows — my couch is pillow-less as well! 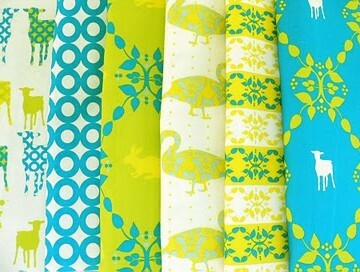 Laurie’s fabrics are so adorable! Wish I was rich. I’d order one of each! I really like the fabric. Thanks for showing us what’s new out there in fabric land but $34.00 per yard is a bit much for my budget. I do enjoy your blog. THERE SOOO CUTE!!!!! I LOVE them!! I can’t get over the little animals and there adorableness! Sorry I haven’t commented in a while but i had mid-terms all week and my life was CRAZY!!! I had like no time for anything!!! AAHHH! So glad its over with see you on Sunday. Absolutely adorable pillows and this fabric is sooo cute. wowsers! your quilts are amazing. i’ve just started to learn how to quilt and you have provided some wonderful inspiration. Oh, I LOVE those fabrics and the quilts you’ve made with them! Thanks for telling me about this!